The Origin store was running a 48 hour free play for Titanfall this weekend and I decided to try out the game to see if it was worth the $30 they were selling it for. In the process I made a Logitech G13 profile. The profile is similar to most FPS profiles I have made with jump and melee on the mouse. Titanfall has some unique keys with the Titan interaction and each class’s special ability. 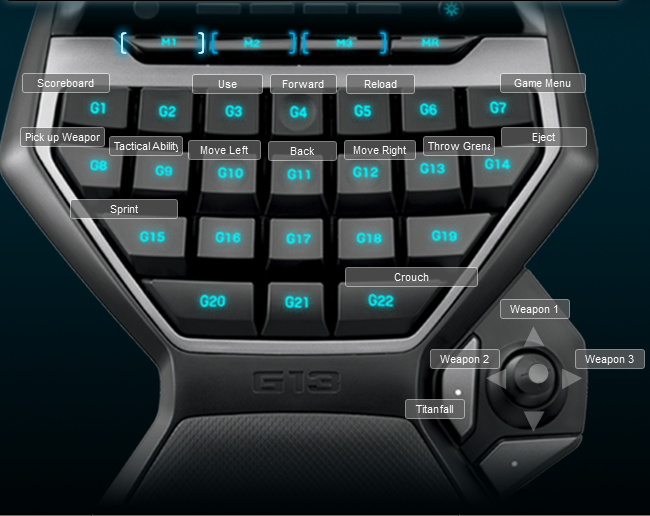 The G13 works really well for the game though compared to the keyboard setup I saw in the game. Below is a screenshot of the keyboard layout.